Ohinemutu pa on Lake Rotorua. 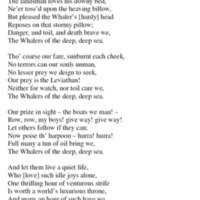 The whalers of the deep deep sea - lyrics of the song by Mrs St. George. The whalers of the deep deep sea. Notes on cover: "Owned by M.E. Hodgkinson of Riverton in 1857"
[Maori portrait: man in cloak. 1850] Maori portrait: man in cloak. Scene in New Zealand in 1841.